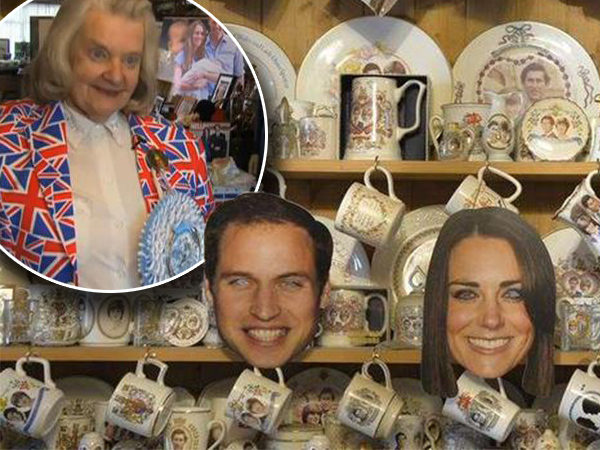 Is this the world’s biggest fan of the British royal family? British pensioner Margaret Tyler is believed to have the world’s biggest private collection of British royal memorabilia. Her small home is bursting out of its seams with more than 10 000 collector’s items that range from photos, statuettes and plates to tea towels and life-size cut-outs of the royal family. The media have dubbed the 70-year-old the “queen of royal memorabilia”. She began her collection in 1977 when Queen Elizabeth II celebrated the first quarter century of her reign. Today several rooms in her home are dedicated to the queen, the late princess Diana and the younger generation of royals. Her lounge is stuffed with memorabilia of Prince William, his wife, Catherine, and their son, Prince George. And Tyler has already created a space for the new royal baby expected to be born at the end of April. “I’m more than excited . . . It feels as if it’s my last thought at night and my first thought in the morning,” she says. She’s already put up a banner outside her home that reads: “Congratulations with the birth of your child.” As with the birth of Prince George in July 2013 she plans to be outside the hospital to await the new baby’s arrival. Her collection is insured for more than R700 000. She’s set aside the second storey of her home and for a small fee will take guests on a guided tour. Many guests bring cake and tea and socialise during their visit. Tyler says many of the items were gifts from other royal fans who had to downscale their collections and wanted a good home for their collectables.